Trek Date: August 30th, 2013. The end of summer. It was crazy hot. The perfect time for a hike in the desert. So I loaded up the blue shark with an ice chest full of water, packed some snacks, camera gear and the hike pack and went to meet Murbachi. 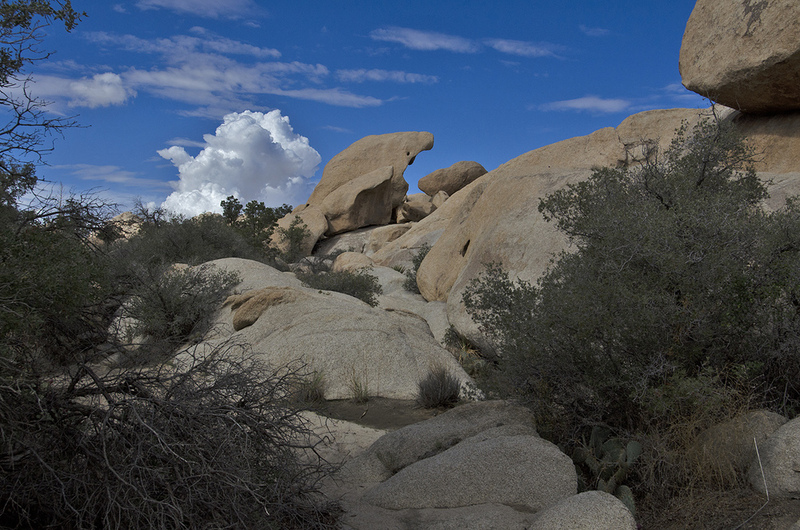 Among our destinations for the day in Joshua Tree National Park was Garrett’s Arch. I can’t remember exactly where or when I first heard/read about Garrett’s Arch, but it had been on my list of places to find for some time. As it’s located a ways back in the Wonderland of Rocks, I was a bit wary about going in alone. Luckily, Murbachi had tramped around a bit in the Wonderland on one of his 3-D photo safaris and so was familiar with the first part of the journey. After some online recon and help from the amazing ‘Google Earth,’ we were pretty sure we knew exactly where GA was located. We were in the middle of monsoon season, and the park had had some heavy rainfall during the past ten days, as witnessed by numerous small catch-basins of water. Our hiking day, however, turned out to be almost picture-perfect. It was a bit on the warm side, but scattered high clouds helped keep the temperature from being too excessive. Some cumulonimbus clouds off in the distance, a striking blue sky between the clouds and the mounds of oddly-shaped quartz monzonite rocks combined for some stunning photo opportunities. We parked at the small dirt parking area located a little ways northeast of the main Barker Dam parking area, right at the trailhead for both the Wall Street Mill trail and the route we would be taking into the Wonderland of Rocks. Taking the left branch at the first fork in the trail, we made our way to the remains of the Wonderland Ranch (worthy of its own story in a future post). The entrance to the main wash we would be following is almost directly west of the Ranch ruins, and after taking a few photos, we headed into the wash. If you’re paying attention as you hike towards the main north/south wash that leads into the Wonderland, you might run across a very interesting spot. A group of small caves show evidence of having been used by man in prehistoric times as well as in recent history. A fading pictograph is on one rock wall, and out in front of the openings is a bedrock mortar. 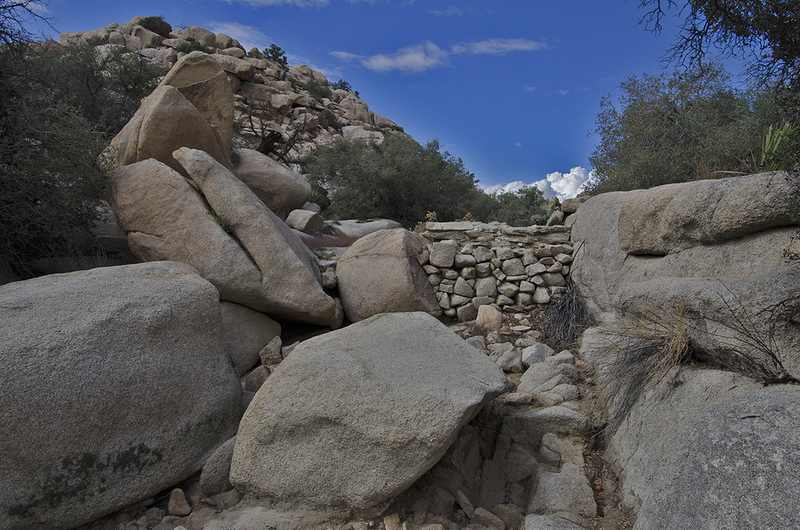 Portions of the openings have been closed with rocks and cement, evidence that they may have been used for storage during the days of the Wonderland Ranch. After reaching the main wash, we headed north. We chose the path along the right side of the wash and it was relatively easy to follow with a little bit of rock scrambling and brush avoiding. The scenery is amazing in the Wonderland, but after a while the rock formations and branching canyons can begin to look similar and it’s easy to get lost. Maps, satellite images and hike planning are good things. 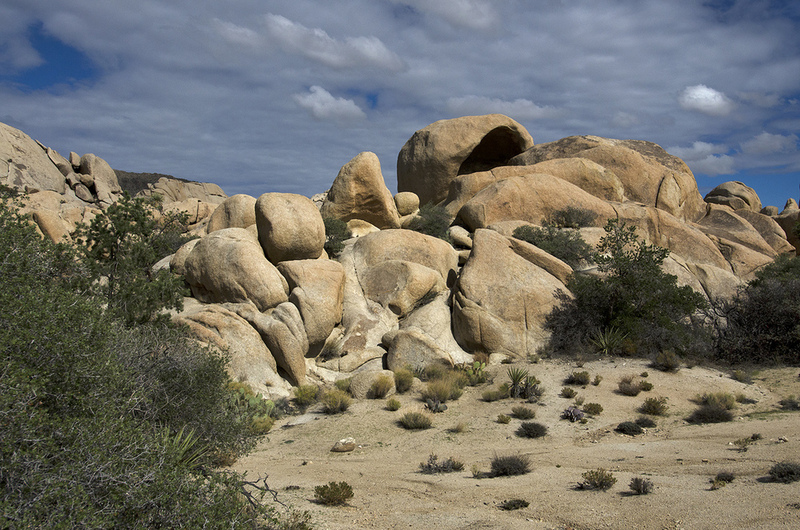 It’s also a good idea to learn the names and shapes of some of the significant rock formations in the Wonderland. They make great landmarks and can definitely help you keep your bearings, and keep you from becoming a statistic as well. Luckily for me, Murbachi has a keen eye for rocks and shared the names of many as we hiked up the canyon. At first I thought he was making some of the names up, but they were all legit. We passed the famous Walrus off to our right, which is also known as the Creature when viewed from the opposite direction. Funny how things can look one way on the hike in and appear totally different on the hike out. We were soon nearing Foolproof Tower on the left side of the canyon. It’s a tall chunk of rock with an interesting overhanging lip and makes a great landmark, especially when we hiked deeper into the “Wanderland.” It’s easy to spot and marks the wash we would need to take on the return trip out. As we began to pass Foolproof, the canyon opened up into a very pretty area and gave us a great view of the next landmarks we would be heading towards; Punk Rock and the Freak Brothers Domes. Several attractive and alluring smaller washes tried to entice us westward out of the main canyon, but we continued north, aiming for the imposing Freak Brothers Domes (of the three Freak Brothers, I think the one on the north end is my favorite). Continuing up the main wash a bit past the Freaks, we turned east into a canyon that would lead us to our final destination. Passing the Weenie (use your imagination) and then Fat Freddie’s Cat and Peabrain, the heat began to take its toll as this was our second hike of the day. We decided to take a short rest at the Red Obelisk and then push on to find Garrett’s Arch. Briefly refreshed, we continued east along the trail which soon widened into a very large open area. On the distant side of the plateau we saw the rock piles wherein the seldom seen arch awaited. Before making our final assault on the arch, however, we took a short detour to find what I’ll call the Cave Boulder. It’s basically a giant boulder with an opening on two sides that you can crawl into and once inside, there is hollowed space big enough for several people to stand and walk around in. A pretty cool spot and easy place to find if you’re in the area. Climbing out from under the rock, we backtracked a little ways, rounded a point and continued east for maybe about 100 yards. And there it was. Deep in the wanderland, we had found Garrett’s Arch. Purported to be the largest arch in the park, it was discovered by park ranger Gary Garrett. It’s about 100 feet above the canyon floor and could ‘probably’ be scrambled up to for a closer look. I think I’ll save that adventure for another day, or possibly check around the other side and see what the approach is like from the back. It’s definitely an impressive sight and well worth the hike. We hiked approximately 4-1/2 miles roundtrip on our fairly direct path, which included a little wandering around for photos and a wee bit of backtracking. Total time elapsed was 3-1/2 hours. The hike could definitely be made in less time by those on a mission, or it could be lengthened into an entire day trip as there is so much to do and see along the trail to Garrett’s Arch. For those interested, here are a few GPS coordinates for points along the trail. These were taken from Google Earth and should be fairly accurate, but please don’t rely on them as gospel, always do your own research before any hike. Let’s go see what we can find. Google Earth Satellite view with three major landmarks.